What do 10 pins and a big heavy ball have to do with kindergarten? Quite a lot, actually. Believe it or not, bowling is a sport that touches on many aspects of kindergarten preparedness. Plus, it’s fun! Don’t worry if your child is a bit clumsy, you can work on the Fred Flintstone fancy footwork later. Use bowling as a hands-on excuse to work on some post-preschool skills. Self-confidence. Gotta love those bumpers. Your preschool kid will nurse a feeling of accomplishment every time she rolls that 6-pound ball down the lane. With bumpers on either side, she’ll avoid the ill-fated gutter ball. Instead she’ll get an instant boost of self-confidence as her ball knocks down, at the very least, one pin each time. She probably won’t realize that something is preventing her from the much-maligned gutter, but there will be plenty of opportunities later in life to learn about missing and defeat. Patience. 4-year-olds aren’t very strong yet. And there is no better way to observe this than by asking your child to roll a ball 1/6 his weight down a seemingly endless alley. Bowling is not an instant gratification kind of game. It takes patience. Your child will have to wait awhile for pin-crushing action: for the rack to sweep away felled pins, for pins to be reset, and for the ball to make its way to his anxious hands through the mysterious under-the-floor ball-retrieval system. Turn-taking. Even if it is only you and your child, it’s good practice for you to bowl, too. This will teach her how take turns and share the fun. Cheer for her and encourage her to do the same for you. It will help her pass the time, and builds an unselfish sense of excitement at another’s success. Sportsmanship. Chances are there will be others in the bowling alley. Many people are forgiving of a youngster’s boisterous nature, but a serious bowler could take issue with it. 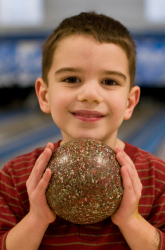 Encourage your child to keep his distance and wait until neighboring bowlers have rolled their balls before he muscles his own down the lane. You’ll get a lot more smiles your way. Hand-eye coordination and balance. Your child can gain a sense of control and learn that she can direct the ball according to her release point. During your turn, show her what would happen if you tried to bowl at an angle, down the side or down the middle. A heavy ball can be awkward for a little person to hold, so this will teach her how to stay balanced, aim, and keep her eye on the target simultaneously. So the next rainy day, or a day when you’re looking for something new, consider a trip to the local bowling alley. First, call to find out when they have open lanes. If you’re bringing along a preschooler, check if they carry small sized bowling shoes. (If not, don’t worry. Most bowling alleys won’t care if a preschooler has the proper attire, as long as she’s not running rampant through the lanes.) Make sure you ask them about price and any special family deals. Bowling is not an inexpensive afternoon, and could run you $40/hour for a family of four. Not in the budget? Try these bowling games at home for a one time cost: International Playthings iPlay Six Pin Bowling Set for $12.99 or the Little Tikes TotSports Bowling Set for $17.99. Whether you’re looking to escape the rain, the house, or just need to change lanes, hit the alley rolling with an afternoon of bowling. Yabba-dabba-do!